Moths always seem to go for favourite clothes. However no one can accuse a moth of having good taste. If you were a moth, you would be repelled by the beautiful cedar, lavender scent of these beautiful wooden moth balls. Yep, that`s the word: crazy. Just think, butterflies are in gardens supping on nectar, whilst moths choose to be in the dark attacking your sweaters. 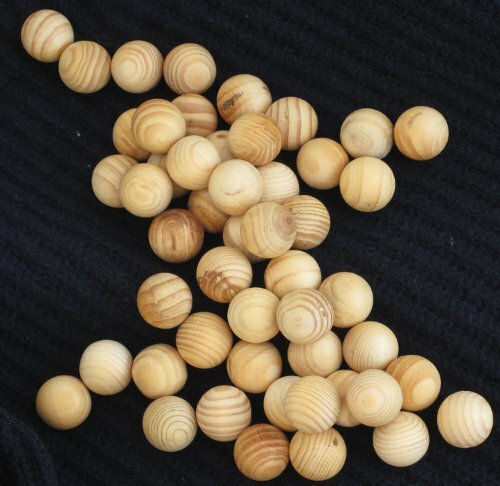 Anyhow take these cedar and lavender scented wooden moth balls, chuck them in your drawers and wardrobes and put off those crazy wacky clothes munchers. While you are enjoying the anti moth scent and beautiful grained wood, your clothes are being protected from moths. Moth balls come in packs of 50, maybe get some to see and smell for yourself, or get hundreds to spread wherever you store your clothes. Moth Balls text, images and video are copyright.